OK, let’s get serious here, folks. I want to propose something that’s been on my mind for at least 20 years now. I want the United States mint to stop making pennies. I am dead serious about this, too. 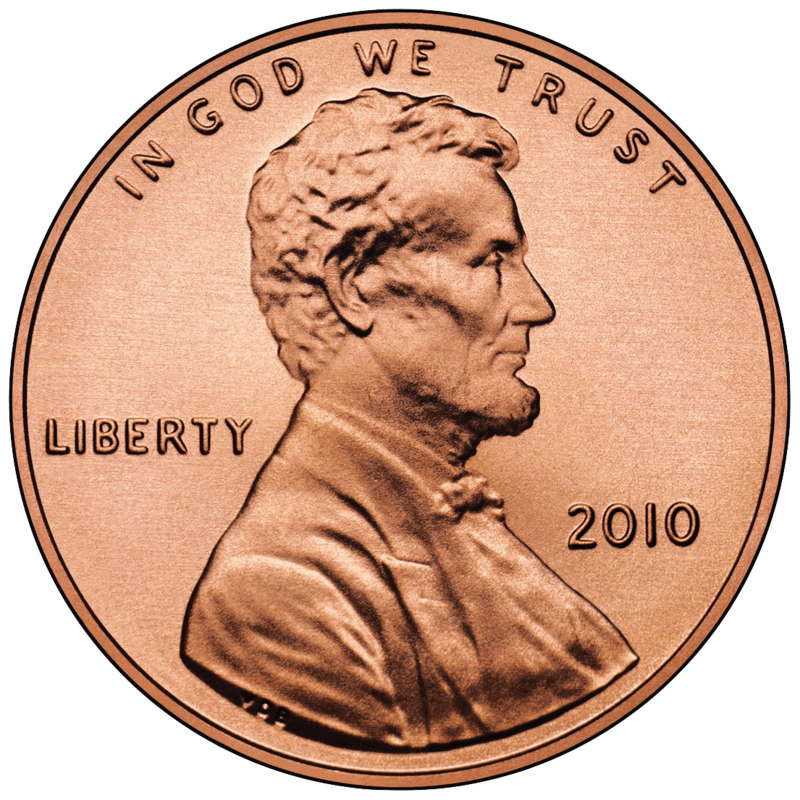 When you go to the store and pay with cash, your change almost always includes those coins that are 97.5% zinc and 2.5% copper with a value of one one-hundredth dollar – the penny, the cent, the Lincoln head. Now, what do you do with those pennies? Do they even make it out of the store, or do you throw them into the little “Need One, Leave One” tray at the counter? If the former, once you get them home, do you put them somewhere where you use them again in a future transaction, or do they just go into some container where they’ll stay until they get too numerous forcing you to bring them to a change counter somewhere? I took a scientific survey* which shows that 91.3%* of people don’t ever use pennies for a purchase unless they happen to have the right amount on their person to avoid receiving more pennies. So, what do you have? What’s that? “Nothing?” Thought so. There’s even no more “penny candy,” at least not for as long as I can remember. Now, how about another experiment? Go to a city. Walk around until a person asks you for some spare change. Hand them a penny. How did they react? I’d bet you a nickel that they were angry to some degree. Once you wiped the spit off your face, did they seem grateful at all? Probably not. Here’s the thing – inflation has rendered the penny all but useless. People not only can do without them, but also don’t really want them. They’re used simply because they’re here. So, aside from their impracticality, why else get rid of the penny? How about cost? According to the United States Mint, in 2010, the cost to mint one penny was 1.79¢ (Click the link and look at the first table on page 29). Think about that for a minute… to make a penny, the US government spends almost 2 pennies. In 2010, the US Mint shipped 3,487,000,000 pennies (Page 28 in the last link). That’s three billion, four hundred eighty-seven million of them! So, US taxpayers (of which I am one) spent $62,417,300 to make pennies worth a market value of $34,870,000! I know that’s a lot of zeroes, folks, but stay with me for another minute. We wasted $27,547,300, over 27.5 million dollars! That’s right, we just threw it away, for a coin that is impractical and, really, unwanted. We can add “unnecessary” and “wasteful” to the list. So, if we get rid of the penny, what changes with our spending? Well, not a whole heck of a lot, really. If we can’t slice the dollar down to its hundredth portion anymore, we merely have to round those pennies to the nearest twentieth dollar. That’s the nickel, my friends. This is simple, really. If a sale comes to $27.32, it rounds down to the nearest dime, or $27.30. If a sale comes to $2.77, it rounds down to the nearest nickel, or $2.75, and so on and so forth. This wouldn’t be the first time the US has changed its currency in this manner. You may have heard of the hay penny, also spelled ha’penny. It was the half-cent. The US minted them from 1793 to 1857. Why did they stop making them? Because the value of a half cent became worth less and less, and its continued use became impractical. In other words, for pretty much the same reasons I am using to make my case to kill the penny. What do you say, folks? Do you think the time has come to kill the penny once and for all? Let me know in the comments below. * – By “scientific survey,” I do not mean scientific in any way at all, nor a survey by any stretch of the imagination. I’m really just stating my own personal opinion, agreed upon by a few of my friends. This entry was posted in Joke But Serious, Thoughts and tagged Common Sense, Just For Fun, Money, Pennies. Makes sense. Which is why our government hasn’t done it yet. No kidding. I could post a million things (and probably will, eventually) that are practical, possible and would improve our lives, even in the most minor of ways. There are so many things our elected officials (of both parties) pound their chests about that never get done even in the best of political climates. I ought to run for Congress, except that I get so sick of the political process.